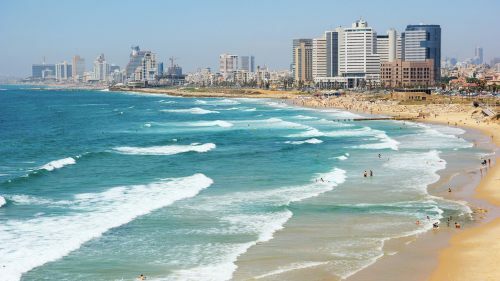 Air Canada is showing some fares between Toronto and Tel Aviv, Israel that are so low, they are quite likely a mistake. It's possible other destinations are a part of this mistake, so stay tuned on Twitter @YYZdeals for updates. Update 4/28 @ 8:08 PM EST - It looks like the fares to Tel Aviv have been fixed. You can try experimenting with other dates to see what prices come up. I would start by focusing on Sunday to Wednesday to Wednesday flights like in the example above. 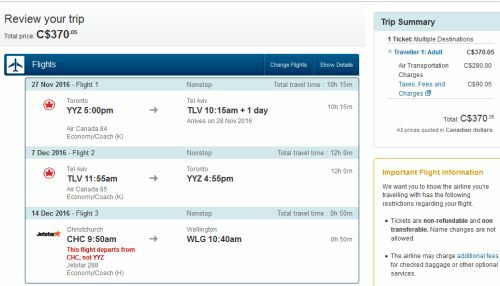 3 Responses to "Mistake fares: Toronto to Tel Aviv, Israel - from $370 CAD roundtrip including taxes"
First of, thank you so much for having this blog. You are doing fantastic work my friend. One quick question. For the Toronto-Tel-Aviv fare, have you tried purchasing the ticket ? Does the system let you go through and use the credit card or does it kick you out ? Expedia is showing price jump to 569 for those dates..